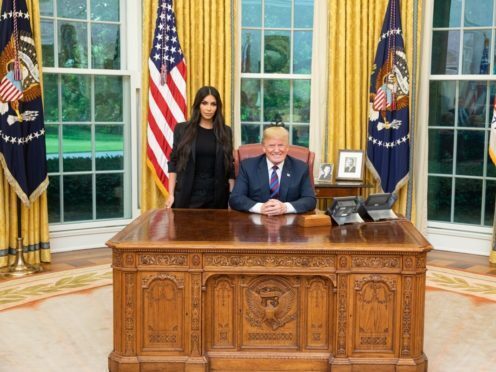 When Kim Kardashian West posed for a picture in the Oval Office with President Donald Trump she must have known what was to come next. The official picture was all flags and phones in the Oval Office and excitedly shared by Trump on his go-to platform Twitter. The two did discuss genuine issues – including the incarceration of Alice Marie Johnson, 63 – a woman serving a life sentence for non-violent drug offences and who is not eligible for parole. But the picture was an opportunity too good to miss for online creatives. Where some saw the US president and a reality TV star others saw something entirely different and it wasn’t all down to Photoshop. Perhaps he should be talking to another Kim. And for some, the sheer bizarreness of the scene could only be amplified. This guy even made a version to meme. And had a crack at it himself. The internet didn’t break this time but it was a picture truly of its age.